This is a privately owned unit and guests are renting from the homeowners through Vacation Realty Hawaii (as will appear on your credit card statement). Therefore your reservation is non-transferable between other properties. 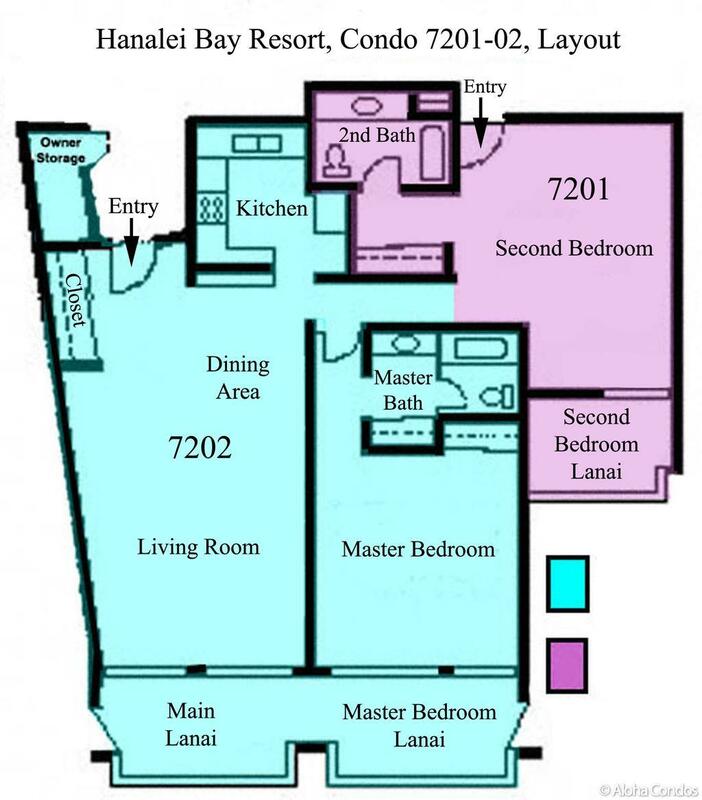 Resort Fees: HANALEI BAY RESORT WILL CHARGE YOU $20 PER DAY FOR RESORT USAGE. THIS INCLUDES POOL TOWELS,AMENITIES AND WIFI. THERE ALSO IS A $6 PER DAY PARKING FEE PER CAR. THE GUEST IS RESPONSIBLE FOR PAYING THESE CHARGES WHICH ARE DUE AT CHECKOUT. Resorts that require “resort fees” for guests staying on the property solely make the decision on what the amount of the fees will be and it is out of the control of the owner of this property. These fees are subject to change at anytime without notice and could change before your arrival and could be different than the original fee stated in your reservation. We make every effort to communicate changes in fees as soon as we are notified. Amenities provided by third-party vendors (for example utility companies or subcontractors) are beyond our control. We do our best to provide services such as cable television, fee-based internet (wireless password 7202guest), and resort telephones. Should these be unavailable for part or all of your stay we will do our best to help restore services, but ultimately cannot be held responsible. Should you absolutely require internet access we recommend you make arrangement for these services through a cell phone company. The regular occupancy for 7202 is 2, however 2 additional people can be accommodated on a trundle bed in the living room. The regular occupancy for unit 7201 is 2. The regular occupancy for 7201/02 is 4. The maximum occupancy for 7201/02 is 6. Guests are obligated to disclose the actual number of occupants prior to arrival. We provide sheets for each bed and two bath towels per stated guest. There is no daily housekeeping service, but you are renting 7202 or 7201/02 you are welcome to use the washer/dryer in the unit. If you are renting 7201 you are welcome to use the coin-operated laundry by the 8000 building. If you have an interim clean included with your reservation we will launder the linens during the clean. Please do not leave personal laundry in the washer when housekeeping is coming for the interim clean. Amenities provided by third-party vendors (for example utility companies or subcontractors) are beyond our control. We do our best to provide services such as cable television, fee-based internet, and resort telephones. Should these be unavailable for part or all of your stay we will do our best to help restore services, but ultimately cannot be held responsible. Should you absolutely require internet access we recommend you make arrangement for these services through a cell phone company. Hanalei Bay is my favorite place in the world. Great views from our condo - sunset from our lanai every evening. Liked the salt water pool, fresh water pool, cooking grill area where we met others. Clean, comfortable, relaxing. Hanalei Gourmet is a great restaurant. Hanalei Bay Resort 7201/02 is a two bedroom, two bath with two plush king beds, plus a trundle bed which provides two twins. With newly remodeled bathroom countertops, showers, tile and kitchenette, full kichen and washer/dryer this unit is fully equipped. It is also one of the most private and quite at Hanalei Bay Resort, however the best feature, of course, is the jaw-dropping view of Hanalei Bay and the surrounding Makana Mountains. Tropical lush garden view to boot! Door opens up to living area with Kitchen and bedrooms to the left. Spectacular ocean and mountain views as soon as you open the door! Gorgeous ocean and mountain views! Tropical garden veiw to boot! Second half has two beach chairs and space for hanging clothes. Full Bath with tiled floors and plush white towels. 2 Bedroom 2 bath unit with full kitchen, living and dinning areas. Can easily accomodate six guests with plenty of space to share. I stayed at HBR Condo 7201-02 with two of my teenage kids. We found the condo to be clean, spacious and perfect for our family. It could easily accommodate five or six adults. The views from the condo are fantastic, with a beautiful sunset every night and a great view of the cliffs beyond Hanalei. Resort staff was capable and friendly. There are long walks from the unit to the lobby or the restaurant and the golf cart service is very spotty, but if you are willing to hike a bit, everything can be reached with a ten minute walk or less. We will be back! We had a wonderful stay at Hanalei! The condo was spacious with fantastic views. Everything we neede was in the condo...even stuff we didn't expect! Snorkel gear, coolers, body boards, and chairs! Just made the stay perfect. The resort staff was exceptional! So welcoming and friendly. We had stayed at the Hanalei Bay Resort a few years back and it's an amazing property. The people are so friendly, and the pool, Happy Talk Lounge, tennis courts, and spectacular private beach make this destination a dream place to relax and live Aloha style. This particular condo is in need of updates and cleaning. The carpets felt sticky to the feet, the paint and furniture are worn, and the overall feel is not inviting. Additionally, when we walked in the unit smelled of urine. It wasn't until day 5 of 8 that we figured out it was the toilet bowl brush that was filled with urine water. With the spectacular view and feeling outside, I would hope the owners would invest in a makeover the rooms. Paint, new flooring, and new furniture are needed to welcome one to sit and enjoy the unit, and would make this place somewhere I would return to over and over. We are looking to return at the end of this year and I will definitely not stay in this unit. Thanks for posting your feedback for the unit 7201/02 at the Hanalei Bay Resort. It is a great resort and a perfect location and I would mention the views from this condo are exceptional and are what memories are made of. I understand that you felt the condo needed some updates. Actually this condo has had some updates in very recent years including the entire interior was painted, the bathrooms got new tiled showers, new toilets and new tile floors and as well as the kiitchen floor. The master bedroom got all new furniture a a few years ago and bed linens even more recently. However even with these new features, I believe the owner is looking into continuing with some more remodeling. These units are individually owned so furnishing and finishes are very different from one unit to another. Perhaps before you stayed in other units that the owners have put in an extensive amount of upgrades. However these units also will reflect in the price you will pay and one can choose what is more important to them with an accommodation. We wish you would have contacted us right away instead of waiting 5 days about the toilet bowl brush. I am certain the toilet bowl brush would not have had anything on it except for the cleaners used with it which could have been a variety of different products but most likely clorox. Of course the brush would not be used until the toilet is flushed and we do sanitize the bathrooms prior to each guest arriving. We wish you well in your continuing returns to the resort. This condo is extremely well equipped and spacious. We spent a week at the condo with 2 adults and 2 teenagers. We loved the views from the condo, air conditioning option, flat screen tv's, washer/dryer, nothing is missing in this condo. The resort is also a plus, we used the pool, bought grilled sandwiches at the pool cafe, and attended yoga classes. Our only complaint would be the walk to your car. This condo is the furthest location from the parking lot but don't let that stop you from renting this condo unless you have issues with walking. They do have attendants driving in golf carts to drive you back and forth from your room if needed.